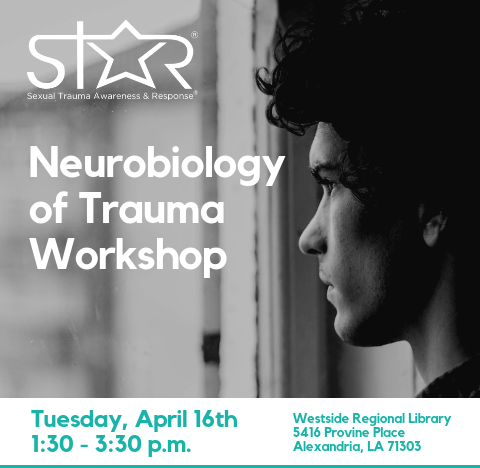 STAR’s Neurobiology of Trauma Workshop educates participants about what happens in the brain during a sexual trauma and how this can affect victims’ behavior. Join us on April 16th in Alexandria for this workshop sponsored by the Junior League of Alexandria. Admission is free and open to the general public. Continuing education credits are available to counselors and social workers for $20. This program is approved for 1.5 General contact hours for social workers by Sexual Trauma Awareness and Response as authorized by the Louisiana State Board of Social Work Examiners. This program has been approved for 1.5 General contact hours for counselors. Sexual Trauma Awareness and Response has been approved by NBCC as an Approved Continuing Education Provider, ACEP No. 6971.